1. Heat the barbecue before you add the steaks. This ensures maximum flavour and tenderness. 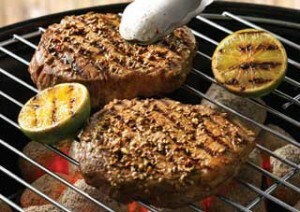 The steak should sizzle as it makes contact with the heat. If you’re cooking a thick steak (or like your steak well done), move it to a cooler part of the barbecue or lower the heat to moderately-high as it cooks.